PIAFF 1997 grey stallion [ Eldon / Pipi]. Breeder and owner: Janow Podlaski State Stud. Strain: Not recorded (family of Szamrajowjka, ca. 1810). 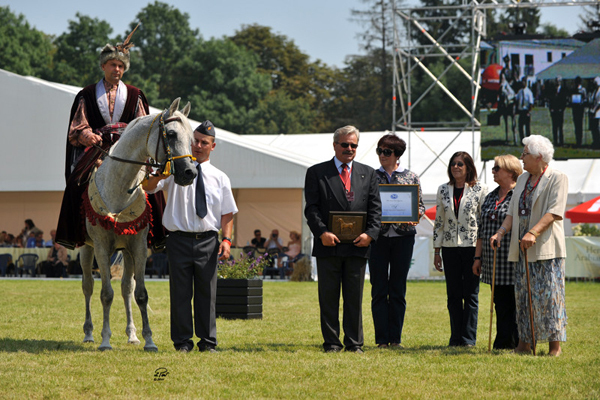 Poland is delighted to announce the award of their 2011 WAHO Trophy to the stallion Piaff. This exceptional stallion belongs to the group of top chief sires active at present in Polish breeding. Along with the former WAHO Trophy winner Ekstern, Piaff is leading the list of sires according to the total number of foals to date – 121. He successfully passed the test of his soundness, endurance and athletic abilities when he raced for 2 seasons as a 3 and 4 year old, being placed 14 times. 2006: (when on lease to USA) Region II Senior Champion Stallion, Burbank, California; Region III Senior Champion Stallion, Reno, Nevada; US National Top Ten Stallion, US National CHampionshipss, Kentucky. Piaff is a grandson of one of the brightest stars of Polish breeding, the incomparable mare Pilarka (by Palas), and is a son of the highly respected broodmatron, Pipi (by Banat). As such, he represents the most successful Janow Podlaski family – “P” – line. So many top horses belong to this line it is impossible to list them all, but one of the most famous in recent years is the beautiful young mare Pianissima. Among Piaff’s progeny are several top quality broodmares and stallions, which have already entered the Polish breeding programme, including Janow Podlaski’s 2010 Polish National Senior Champion Stallion Alert (out of Andaluzja by Sanadik El Shaklan). His progeny are distinguished by their high potential for all kinds of equestrian sport disciplines, as well as in endurance. 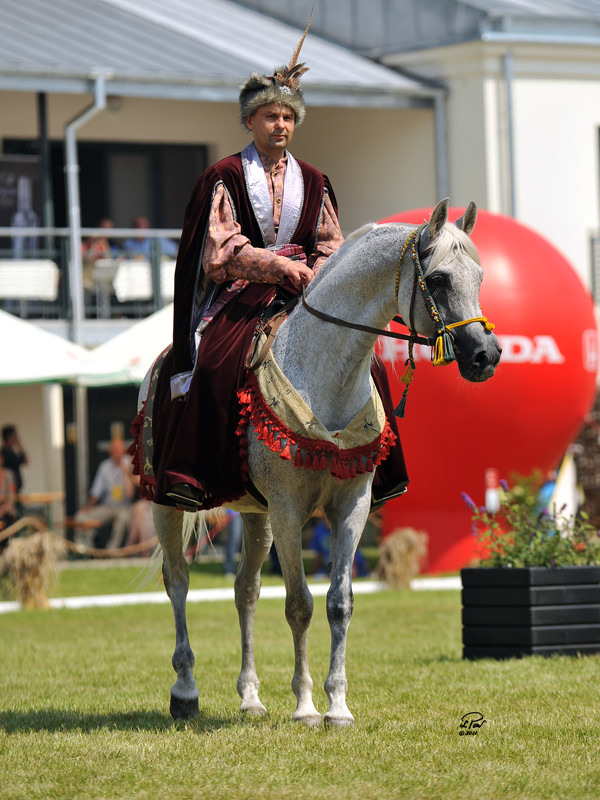 Piaff himself is a wonderful riding horse, like all the stallions at Janow Podlaski he is ridden regularly, and also competes every year with success in dressage and ridden classes, including the very popular traditional costume classes. His fleabitten coat and proud bearing make him a particular favourite of the judges and the spectators.